Testors All Purpose Enamels are fast drying, easy to apply and can be used on many kinds of surfaces. and each bottle color exactly matches its corresponding aerosol spray color. Testor bottle and aerosol spray enamels are all lead free. Professional quality enamels formulated to match corresponding U.S. Government Federal Standard (FS) Military colors. 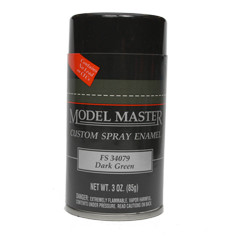 The Model Master enamels offer an incredible range of colors for modelers. The enamel colors are highly accurate and guaranteed to match their real life counterparts. And, there are many colors that are not available from any other manufacturer. They are also intermixable with all Model Master enamel paints.